I love this easy option to sweeping with a broom. All the mess it collectors in tray and you just need to empty it. This was the first sweeper of this type I ever bought. I gave it to my daughter--BIG MISTAKE! The others I have purchased since ARE TERRIBLE and I'm about to get another of these. Quick pickup, long battery life. Only con is that the cup fills up fast and is not THE EASIEST to clean, but it's not bad. More a question of getting it to fit back in place. But it's worth the money, no doubts about that! I didn't like this vacuum. All of the features that should have been pluses did not work out for me. The handle can be adjusted so that you can sweep under furniture. I think that the handle is too flimsy and I would rather not change it. It was too much of a hassle. It cleans both carpets and floors, but not very well. Mine got stuff caught inside of it and stopped working. It was too difficult to get it unstuck, so I just threw it out. 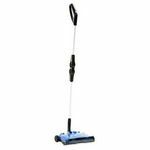 The shark cordless sweeper vacuum does not have a cord that you have to worry about tripping over or getting in your way. However, the charge doesn't last very long and you have to recharge the thing before you can use it again. Charging seemed to take at least a day. I owned this vacuum for less than a year and then threw it out. It is inexpensive, but doesn't work as well as other vacuums. I suggest paying more for a better quality vacuum that will last awhile. It took me several months to decide whether I wanted to try he Shark Cordless Sweeper Vacuum or not. My sister had recommended it to me, so I went ahead and bought it. I got it home, put it together and charged it as instructed. After the charge time was up, I took my vac for a tria run. Boy! Was I pleasantly surprised! It has lots of pickup power even though the motor sounds wimpy. After the 2nd charge, I expected the motor to have more "oomph", but it remained quiet. You can actually carry on a conversation while you're using the Shark Cordless Sweeper Vacuum. The pickup power was even better the 2nd time around. It grabbed my Christmas Tree skirt so fast, it caught me off guard. My Shark Cordless Sweeper Vacuum is well worth every penny I saved to buy it! I love the handle variation to get under things. I do have to make sure there isn't anything hiding when I go under furniture, because the Shark Cordless Sweeper Vacuum will pick anything of a smaller size up. The good thing is that its easy to retrieve from the little dirt container that is so easy to pull out and empty. I can't get over the greatness of my little Shark Cordless Sweeper Vac. I wish I had purchased this vacuum months before I did. We love our Shark Cordless Vacuum. We recieved it as a Christmas gift and often tout it as a favorite gift. With 3 young children messes are easy to come by and not having to haul out the large vacuum and fiddle with the cord has been wonderful! The Shark light weight and very easy to manuever around and under things. It has an adjustable handle to lengthen your reach. 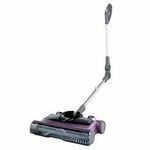 We do not use this as our deep clean vaccum, but this is perfect for those crumbs and messes on the surface of the carpet or floor. The Shark can not only take care of messes on carpet but it is fabulous for hardwood floors or similar. It is easy to empty when it gets fully and rechargable. The downside I've found to the shark is that the battery power seems to fade after awhile. This has not changed how much we use it however, we just need to charge it more often. We definitely love our Shark Cordless Vacuum and use it a lot (did I mention it's easy enough for kids to use!). The Shark vac is a great idea for small and quick cleaning jobs. It is easy to uase and has plenty of power at first. The Shark is easy to empty and does a great job picking up many things including pet hair. The problem is that the battery does not last more than a few months. I let the battery completely discharge and fully charge, but it does not help. The Shark stops after a couple of minutes and needs to be fully charged. 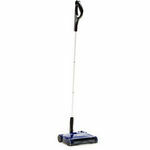 The Shark cordless sweeper is very handy to have around the house, especially if you have hardwood floors. 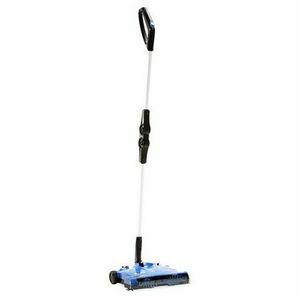 I find myself reaching for this sweeper a lot, and in fact I find myself using it more than my regular full size vacuum on many occasions. I especially like that this sweepeer is lightweight. My full size vacuum is very heavy and hard to move around with, and I think that is why I am beginning to prefer my Shark. The cordless aspect is great for moving around too. Plus the handle rotates all the way down so you can reach under the furniture where the dust bunnies are hiding. I have found that very useful on our hardwood floors as the dust seems to "blow" under all the furniture. Another feature I like is that it has three settings for either Floors, Carpets, or Turbo and I do find that switching between the Floor setting and Carpet settiing lets me go all through my house quickly and easily. The only slightly bothersome thing is that there is a little rotating brush on the underside of the sweeper and it seems to get tangled up with hair and what not quite easily. After every use I need to turn over the sweeper and clean it out. But that is a minor detail and overall I have been very happy with the convenience of this sweeper.